2 Br, 2bath, Single Level Custom Log Cabin On 70 Acres. The close proximity of both town and Nature, combined with the exceptional attributes of our one of a kind log cabin and the very fair price, make our home an unbeatable choice for those who long to get away from it all into the quiet of wide open spaces and skies of Northwestern Colorado, but with some added comfort. The first two things you will notice when you walk into our home is how full of light the house is and how you can't stop looking out the windows. Log cabins tend to be dark and a bit claustrophobic. Ours feels like a breath of fresh air. Each room, including the bathrooms, has it's own forever view. When you can tear yourself away from the windows you will notice how charming, tastefully and simply this house is furnished and how beautifully it has been crafted. There is no clutter or personal stuff. The closets and cabinets are empty and ready for your use! At the same time there is everything you need for your comfort. The kitchen is extremely well supplied. The master bedroom has a comfy king size bed and bath with shower and its own private deck. The twin bedroom can easily be turned into another king and it also has it's own bath with shower. IF you can tear yourself away from the views and night skies there is a 37 inch flat screen TV in the living room with a Direct TV subscription or a DVD player. There is also a 5CD player if music is how you choose to relax. There is also an internet wireless connection. If there is a chill in the air the wood stove/fireplace heats the whole house and augments the in floor heating. Outside on the large forever view deck there is an awning that can be unfurled to provide protection from the sun as you dine, read a book or watch the birds at the bird feeder. A barbecue allows you to cook outside in the summer. Usually people never want to leave to do anything else. In addition, the 70 surrounding acres gives you plenty of room to roam and explore. The elk frequently visit during both summer and winter and the coyotes are usually heard yipping in the distance as you sleep at night. South of Steamboat Springs around the ski area is especially crowded in both summer and winter. You will be in your own private Colorado in our one of a kind cabin on the hill. Susie and Hansi live in Northern California, Susie in the wine country and Hansi just north of the Golden Gate Bridge. Steamboat Springs has always been our 'second home' from the time we were very young and the ski area was just being built. We used to camp up on the ski mountain before there were any runs! Both of us lived in Steamboat for periods of our younger lives, attending the dance and drama camp, Stephens Perry Mansfield, skiing, guiding rivers and hiking in the mountains. We visit Steamboat as often as our lives allow as it as much a part of us as our Northern California homes. 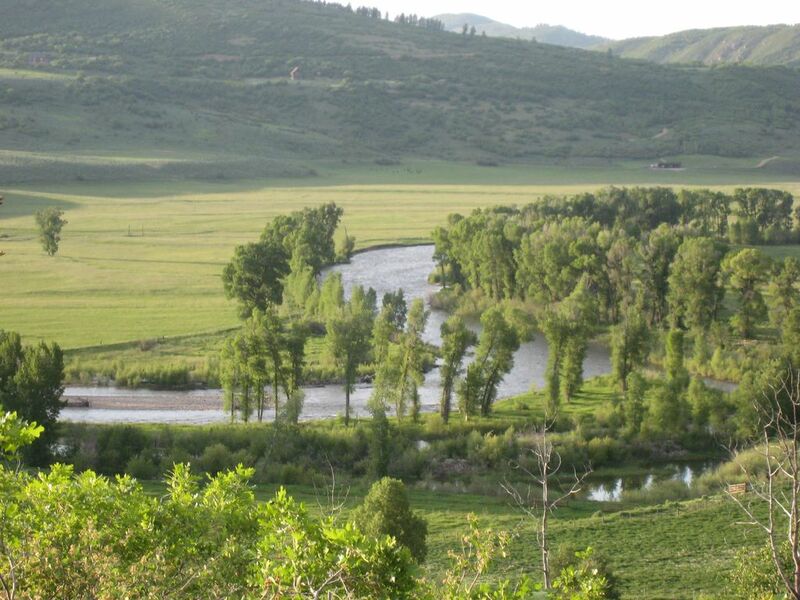 This property was first discovered by our father in the 1960's when he fell in love with Steamboat and decided to fulfill his dream of owning a cattle ranch. The original ranch was 300 acres and extended across the Elk River. In 1975 he built the first version of our log cabin. For 20 years our family enjoyed spending time together in what our mother called 'dad's ranch in the sky'. In 1996 the cabin burned to the ground and his two daughters rebuilt the cabin as it was by this time an honored member of the family. All but 70 acres of the original ranch have been sold but the feeling is the same as it always has been, forever views across Colorado ranch land and mountains. Well supplied kitchen with all dishes and eating utensils. We have a wonderful caretaker who lives within minutes of the house and will be happy to provide you with any information on the area. Thank you Andrea for saying so! So glad you were able to enjoy our log cabin in the Elk River Valley! Come back anytime! Log Cabin Perfection with Endless Views! This was our first ever trip to Colorado, and we had the most perfect vacation at the Hagemeister Cabin. It exceeded our expectations in every way! First, let me begin by saying that it's cozy! Even with temperatures as low as -26F in the mornings (brrr) we were toasty warm inside! Every detail has been thoughtfully considered - from the kindling supply for the fire, to the beautiful Heath ceramic plates, to spices (they even had paprika! ), to cork stops to save that bottle of champagne we popped open for NYE and didn't finish! We stayed with our (2) small children, ages 3 & 6 and they loved their room, and playing in the snow. The beds were comfortable, the cabin was clean, and oh my - the VIEWS! Spectacular! One day we got quite a lot of snow, and sure enough the snow plows were there mid-afternoon to plow the driveway. The drive into town is pleasant, and it's very convenient if you're planning to ski too. We went 3 days in a row! We hope to return again next year! Thanks Hansi & Emily for a lovely experience. Dear Jennifer, Thank you so much for writing your review. I was wondering how it had all worked out with the cold and the snow. I am SO GLAD it went well and that the cabin was perfect for you. We do try hard to accommodate our guests and it really pleases us when our guests let us know we've done well. It is cozy isn't it? - when the snow is falling outside and the temps drop below 0 degrees. Logs make wonderful insulation especially with a warm fire! We look forward to hearing from you again - you really got a Colorado experience on your first try! Beautiful log cabin situated in the country on an elevated knoll. Beautiful views including river, ranch land and mountains. Gives you the feeling of being in a cabin in the Alps! Has a wood burning fireplace which gives the cabin a cozy feel. Thank you Cynthia! I think you hit fall at just the right time this year. Yes! We are the Alps without the expense of getting there! :-) Hope to hear from you again. What an awesome place to stay! Hope to stay at Hansi’s cabin again. Everything you could want in a remote cabin. In deciding to stay here, I relied heavily on the prior excellent reviews. I am pleased to say that they were accurate. Thank you Greg for posting a review. It gives me such pleasure to know that my guests appreciate and enjoy our special cabin the mountains. We certainly make an effort to create a good experience. Hope to see you again. We really enjoyed our stay at the cabin. Had all the comforts of home but with a lot bigger views. Just secluded enough to unwind and decompress but still only 15 minutes to downtown Steamboat and all of the entertainment. Fantastic property and will hope to book again when we come back. So happy you enjoyed your visit Larry. We look forward to hearing from you again! Beautiful property! Views are incredible from each room! Beautiful cabin, reminds me of a cabin in the Alps. Has wood burning fireplace, which makes it very cozy. Views are incredible and property is secluded. Front door lock is a bit tricky, though. Thank you Cynthia. I am so glad you and your daughter enjoyed the cabin. And Thank you for letting me know about the lock. I plan on dealing with that when I am out there this Spring. Our custom log cabin is situated 5 miles north of downtown Steamboat Springs, 8 miles from Steamboat's World Class ski area and overlooks the famous for fly fishing Elk River and the Sleeping Giant Mountain to the West. Located on 70 acres in the heart of Colorado ranch land our hilltop cabin offers quiet and seclusion just minutes from downtown Steamboat Springs. Our home gives visitors to this area the opportunity to take in the wide open spaces, clean air, forever views and dark night skies of Northwestern Colorado. A few miles upstream there are areas for public fly fishing on the Elk and about .5 miles up the road are trail heads to access Mt Zirkel Wilderness Area and the Continental Divide. Steamboat Lake is an easy and incredibly scenic drive North with more trail heads off Seed house Rd east of Clark - 15 minutes up the road. In the other direction the old western town of Steamboat Springs offers many fine dining opportunities as well as a summer time ProRodeo Series, Art Fairs, the Symphony, live theater, unique shops and wonderful hot springs. The Steamboat Springs Ski Area is famous for it's 'champagne powder' and tree skiing. Skiers and snowboarders of all abilities will find terrain and instruction suited to their needs.